As we shift from warmer to cooler weather, there is nothing like a hot bowl of soup to give us that satisfying warm, comfort food feeling. When I was at the school for Integrative Nutrition, we talked specifically about seasonal eating. I never really paid much attention to foods for different seasons. I knew good old fashioned chicken noodle soup had been associated with colds and flu for centuries, cold potato salad and watermelon were served at BBQ’s during the summer, and pumpkin was all the rage in the Fall. But, I’m embarrassed to admit, I had no idea why. I thought they were more about tradition rather than the ideal growing seasons and how those foods cool and warm our internal bodies. Soup warms us up and I have no doubt you’ll be consuming some delicious homemade soups this season…..and I hope this short list will give you a head start. I’ve put together my top favorite soups that I personally love based on taste, season, and simplicity. I hope you enjoy and comment below on which one sounds the best to you and that you’ll be experimenting with first. I love this one because it’s delicious and easy. Takes less than 30 minutes. And can be adapted to include dairy or non dairy alternatives. I’ve tried both and they work quite well. Nina is the author of The Real Food Cookbook. She includes all things “real food” in her recipes so she is not dairy and gluten free, but I find her food to be amazing and very adaptable to different eating styles. This soup is not posted online so I’ve given you the recipe here. I’ve also adapted it to include chicken broth. Dice the onion and slice the celery and carrots in thin rounds. heat the olive oil in a large pot and saute the veggies until so soft. Chop the garlic, add it to the veggies, and saute for a few minutes. Add the chicken broth. Do 1 cup first, then depending on how thick you like it, add the other cup or not. Simmer another 10-15 minutes on low. Garnish with a little sour cream or creme fraiche if you prefer. If you’ve ever had the Zuppa Toscana at Olive Garden, you know this soup is delicious. The rich taste of sausage, slight hint of fennel and healthy kale make this a top soup in our house. Make it. You won’t be disappointed. This recipe uses half and half, but I have used full fat coconut milk before and it’s still been great. This one is one of my absolute favorites and I’ve made it at least 10 times. It substitutes cauliflower for potatoes for a low carb version of a hearty potato soup. I’ve also changed it up quite a bit to substitute the flour and the dairy. Topped with a ripe avocado and this soup is the best leftover ever. Sub arrowroot or gluten free flour for the flour. Start with half the recommended measurement and work from there. Use full fat coconut milk for milk. I also like to use an immersion blender on this one just to break up the cauliflower at the end, but that’s just a personal preference. So in replace of a traditional chicken noodle soup, I’ve opted to give you Italian wedding soup. 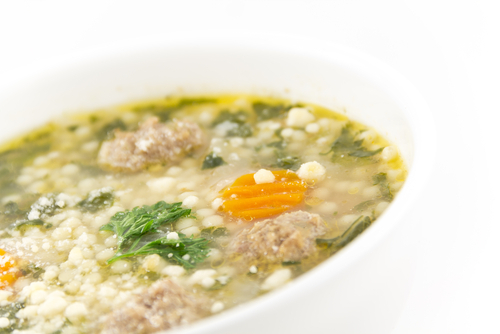 Because we can all find a chicken noodle soup we love, but Italian wedding soup is a great twist on a traditional. It’s pretty much the same thing with meatballs, but your family (and you) will probably love the switch up. This one is super easy. You can choose to make the meatballs or buy them. My kiddos love the tiny meatballs from Earths Best and they work great here. Homemade ones are always great, but if time is an issue, buy them premade. You can also make these meatballs, double batch them and freeze them for when you are ready. You can also substitute to pasta for quinoa. Either way, you’ll enjoy this one. The very first show and chef I fell in love with on TheFood Network was Giada from Everyday Italian. I loved all her recipes and made a lot of the “healthier” ones. I learned so much about food from watching her show. This was before I had kids and before I knew anything about food. But I credit Giada from making me fall in love with the cooking process. But I still can’t figure out how she stays so skinny? I have been eating this Italian soup for YEARS and it’s one of the first I ever learned to make. It’s still one of my favorites and is so simple. I do recommend the ciabatta bread with it if you can stand it. But if not, find a wonderful gluten free bread that you love and enjoy this rich and creamy soup. * all the same substitutes above can be used here too. Soup doesn’t have to be complicated. In fact, they can be quite easy and one of the most nutritious and satisfying Winter foods you can eat. Which one will you be trying first? Leave a comment below and let me know.